Clathrin-mediated endocytosis (CME) is a common pathway used by G protein-linked receptors to transduce extracellular signals. We hypothesize that platelet-activating factor (PAF) receptor (PAFR) ligation requires CME and causes engagement of β-arrestin-1 and recruitment of a p38 MAPK signalosome that elicits distinct actin rearrangement at the receptor before endosomal scission. Polymorphonuclear neutrophils were stimulated with buffer or 2 μM PAF (1 min), and whole cell lysates or subcellular fractions were immunoprecipitated or slides prepared for colocalization and fluorescent resonance energy transfer analysis. In select experiments, β-arrestin-1 or dynamin-2 were neutralized by intracellular introduction of specific Abs. PAFR ligation caused 1) coprecipitation of the PAFR and clathrin with β-arrestin-1, 2) fluorescent resonance energy transfer-positive interactions among the PAFR, β-arrestin-1, and clathrin, 3) recruitment and activation of the apoptosis signal-regulating kinase-1/MAPK kinase-3/p38 MAPK (ASK1/MKK3/p38 MAPK) signalosome, 4) cell polarization, and 5) distinct actin bundle formation at the PAFR. Neutralization of β-arrestin-1 inhibited all of these cellular events, including PAFR internalization; conversely, dynamin-2 inhibition only affected receptor internalization. Selective p38 MAPK inhibition globally abrogated actin rearrangement; however, inhibition of MAPK-activated protein kinase-2 and its downstream kinase leukocyte-specific protein-1 inhibited only actin bundle formation and PAFR internalization. 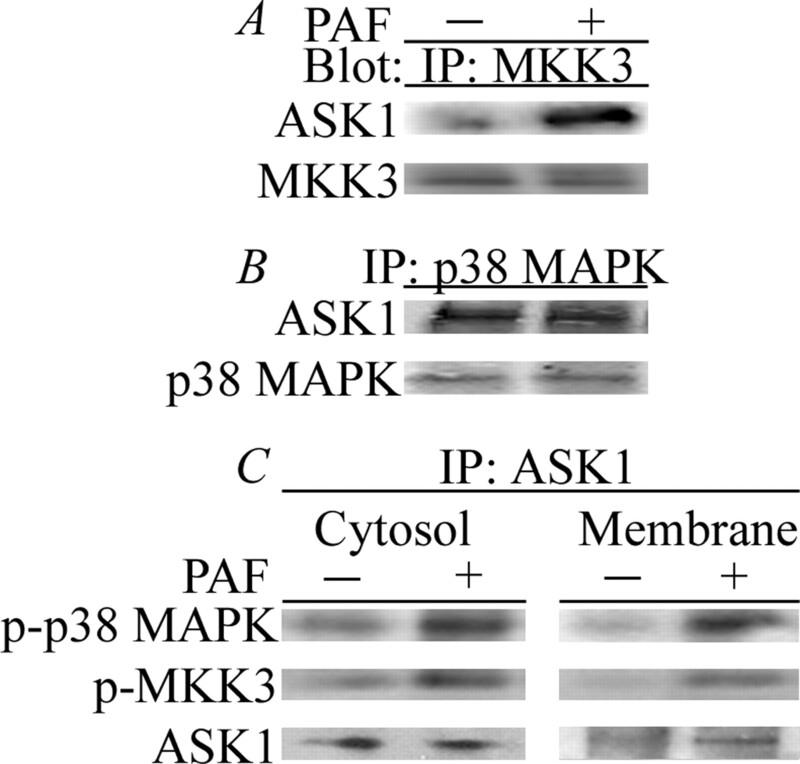 In addition, ASK1/MKK3/p38 MAPK signalosome assembly appears to occur in a novel manner such that the ASK1/p38 MAPK heterodimer is recruited to a β-arrestin-1 bound MKK3. In polymorphonuclear neutrophils, leukocyte-specific protein-1 may play a role similar to fascin for actin bundle formation. We conclude that PAF signaling requires CME, β-arrestin-1 recruitment of a p38 MAPK signalosome, and specific actin bundle formation at the PAFR for transduction before endosomal scission. The G protein-coupled receptors are ubiquitous, and binding of the ligand may cause receptor internalization via clathrin-mediated endocytosis (CME),3 which activates specific signaling pathways (1). Classically, CME consists of three steps: receptor desensitization, sequestration of receptors to clathrin-coated pits, and receptor internalization (2, 3). However, there is increasing evidence for discrete signal transduction at the site of the receptor for each step in CME (2, 4). The initial signal is transduced via coupling of the receptor to heteromeric G protein subunits (α and βγ) (5). These subunits cause the release of calcium stores and the activation of small GTPases and MAPK signaling cascades (5). Within seconds, these signals can be terminated by members of the arrestin family by their binding to the phosphorylated C terminus (cytosolic) region of the receptor and uncoupling it from the associated heteromeric G proteins (2). In addition, arrestins may have a role in receptor internalization and nonreceptor tyrosine kinase activation (4, 6). Cell motility is essential for host defense, especially for leukocyte recruitment to the site of injury. Polymorphonuclear neutrophils (PMNs) play a key role in host defense, and exert their microbicidal function in the tissues. The orderly process of migration from the vasculature to the tissue initiates PMN priming, which can be facilitated by a number of proinflammatory protein and lipid mediators, including IL-8, leukotriene B4, and platelet-activating factor (PAF) (7, 8, 9, 10). PMN priming is characterized by distinct physiological changes, including increased actin polymerization resulting in shape change, firm β2 integrin-mediated adherence to the vascular endothelium, and augmentation of the microbicidal response, both oxidative and nonoxidative, to a subsequent stimulus. In addition, PMN priming agents are etiologic in two event models of PMN-mediated acute lung injury, sepsis, and multiple organ failure (11, 12). Ligation of the PAF receptor (PAFR) recruits members of the arrestin family (β-arrestin-1), which desensitizes the receptor, operationally defined as the inability of repeated exposures to a stimulus to cause multiple signaling events, e.g., the release of stored Ca2+ (13). However, the role of these arresting proteins to facilitate signaling remains undefined. We hypothesize that PAF causes CME of its receptor and before endosomal scission elicits β-arrestin-1-mediated recruitment and activation of the p38 MAPK signalosome and discrete actin reorganization at the PAFR, all required for CME and distinct from actin that participates in cell polarization and chemotaxis. Unless otherwise indicated, all chemicals were purchased from Sigma-Aldrich. All reagents were endotoxin-free, and all solutions were made from sterile water (Pharmacopeia). Acrylamide, N,N′-methylene-bis-acrylamide, and TEMED were obtained from Bio-Rad. ECL reagents were obtained from Amersham. Nitrocellulose paper, x-ray film, and Nunc 96-well plates were purchased from Life Science Products, and indo-1-AM from Molecular Probes. Abs to the clathrin H chain (H-300), PAFR (H-300, N-20), β-arrestin-1 (K-16), dynamin-2 (H-300), TGF-β activated-kinase (TAK)-1 (M-579), apoptosis signal-regulating kinase-1 (ASK1, F-9, H-300), phospho-MAPK kinase-3 (MKK3)/6 (B-9), leukocyte-specific protein-1 (LSP-1, N-20), secondary anti-goat IgG-HRP, and anti-mouse IgG-HRP, and protein A/G Plus Sepharose beads were purchased from Santa Cruz Biotechnology. Dual-phosphorylated p38 MAPK (Thr180/Tyr182), p21-activated kinase (PAK)1, PAK3, and secondary anti-rabbit IgG-HRP were obtained from Cell Signaling Technology, and phosphoserine and pan-arrestin Abs were purchased from Zymed Laboratories and Abcam, respectively. Anti-PAFR for immunohistochemistry was obtained from Cayman Chemicals. Anti-actin-related protein (Arp)3 was obtained from Upstate Biotechnology and phospho-LSP-1 (Ser204) from MBL International. Heparinized whole blood was drawn from healthy human volunteers by venipuncture consent using a protocol approved by the Combined Internal Review Board and Human Subject Committee at the University of Colorado School of Medicine, and PMNs were isolated as previously described (14). Cells were resuspended to a concentration of 2.5 × 107 cells/ml in Krebs-Ringers phosphate buffer (pH 7.35) with 2% dextrose (KRPD) and used immediately for all subsequent manipulations. PMNs (1.25 × 107 cells (whole cell lysate and immunoprecipitation) or 1 × 108 cells (subcellular fractionation)) were incubated with buffer or 2 μM PAF for 1 min. Reactions were stopped with the addition of ice-cold relaxation buffer (10 mM PIPES (pH 7.4), 3 mM NaCl, 100 mM KCl, 3.5 MgCl2, 1.2 mM EGTA, 10 μg/ml leupeptin, and 50 μg/ml PMSF) and immediately sonicated (2 × 30 s). Lysates were cleared and used for Western blot analysis, immunoprecipitation, or subjected to subcellular fractionation as previously described (15). Purity of fractions was determined using lactate dehydrogenase as a cytosolic marker, L-selectin as a membrane marker, and myeloperoxidase as a granular marker. Proteins were separated by SDS-PAGE (7.5 or 10%) acrylamide gel with SDS electrophoresis, transferred to a nitrocellulose membrane, and these membranes were cross-linked and probed with the specific Abs indicated. Cytosolic Ca2+ concentrations were measured by indo-1-AM loading of PMNs and analysis in a PerkinElmer LS50B spectrofluorimeter over real-time, as previously described (16). Briefly, PMNs (2 × 106) were loaded with 5 μM indo-1-AM for 7 min in the dark, centrifuged, and resuspended in warm KRPD. PMNs were placed in a PerkinElmer LS50B with constant stirring, and the calcium concentrations were measured in real-time with excitation at 355 nm and dual emission wavelengths were monitored at 410 and 470 nm. Data were processed using Grynkiewicz equation. PMNs (5.0 × 105 cells) were warmed to 37°C and then incubated with either buffer or 2 μM PAF for 1 min and prepared as previously described (16). Images were acquired with a Zeiss Axiovert fitted with a Cooke CCD SensiCam camera using a Chroma Technology Sedat with single excitation and emission filters and a multiple bandpass dichroic filter and Sutter Instrument filter control. Images were acquired using Intelligent Imaging Innovations SlideBook software. All images compared within a single figure were acquired as Z-stacks in 0.2-μm intervals, and the planes are as described in the figures. All Z-stack images were deconvolved by applying constrained iterative deconvolution and Gaussian noise smoothing from system specific point spread functions (17). Following deconvolution, images were cropped to represent the middle most planes (center ± 10 planes) and the proteins in question masked to represent zero fluorescence in IgG negative controls. Cell polarization was assessed using Nomarski differential interference contrast microscopy (Nomarski images), and for these images, microscopy planes were taken through the pseudopodia as described in the figures (18). FRET determinations were obtained by direct acceptor photobleaching FRET as previously described (19). Within this context, the ability of the two secondary Abs to FRET were acquired between Rhodamine (excitation wavelength, 550 nm; emission, 570 nm, acquired on the Cy3 channel; Jackson ImmunoResearch Laboratories) and Alexa Fluor 488 (excitation, 495 nm; emission, 519 nm, acquired on the FITC channel (Molecular Probes), except in the case of FRETs between clathrin H chain and the PAFR, which were determined using Alexa Fluor 647 (excitation, 650 nm; emission, 668 nm, acquired on the Cy5 channel; Molecular Probes) and Alexa Fluor 488. In all cases, an initial image was acquired of the donor and acceptor channels, and following capture a region of interest was defined, a mask applied, and the specified acceptor (Cy5 or Cy3) ablated (i.e., photobleaching, per manufacturer’s nomenclature). Ablation was accomplished using a Photonics FRAP laser fitted with the appropriate wavelength discriminator (Rhodamine 610 (Cy5) or Rhodamine 540 (Cy3)). FRET efficiencies (Ei) were calculated using the following formula: Ei = [(Ipost,i − Ipre,i)/(Ipre,i)], where Ipre,i is the mean intensity of the donor prephotobleach image and Ipost,i is the mean intensity of the donor postphotobleach image (19). Images are displayed in pseudocolor in which blue is cold (little FRET) and red is hot (most FRET). BioPorter was reconstituted according to the manufacturer’s directions. Briefly, individual tubes were reconstituted to a total volume of 40 μl with KRPD ± 4 μg of the Ab specified in the text for 5 min at room temperature. PMNs (5 × 106 cells) were incubated with buffer, vehicle only, or vehicle with the Ab for 2 h at 37°C. Following incubation, PMNs were centrifuged for 3 min at 1800 rpm at 4°C, and resuspended to 5 × 106 cells/ml. To control for IgG introduction, a FITC-IgG control was introduced, and Z-stack images acquired as described. β-arrestin-1 and dynamin-2 are sufficient for native proteins as demonstrated by use in immunoprecipitation. Furthermore, for intracellular neutralization two different Abs to different epitopes were used. Statistical analysis was performed by paired ANOVA with Bonferroni/Dun post hoc analysis using p < 0.05 or p < 0.01 as the level of statistical significance. To investigate whether PAF-mediated PAFR ligation causes CME, we established a relationship between the PAFR and known CME proteins. Immunoprecipitation of β-arrestin-1 coprecipitated both clathrin and the monomeric (40 kDa) and dimeric (80 kDa) conformations of the PAFR (Fig. 1⇓A and data not shown) (20). Furthermore, β-arrestin-1 coprecipitated the activated, serine phosphorylated PAFR (Fig. 1⇓B). The interaction between the PAFR and β-arrestin-1 were further defined by acceptor photobleaching FRET (Fig. 1⇓C). The interaction between β-arrestin-1 (Fig. 1⇓C, vii–ix; red) and the PAFR (Fig. 1⇓C, x–xii; green) was FRET positive following PAF stimulation (1 min) as compared with resting cells. Moreover, there was a PAF-induced FRET positive interaction between the clathrin H chain (Fig. 1⇓D, i–iii; blue) and both β-arrestin-1 (Fig. 1⇓D, iv–vi; red) and the PAFR (Fig. 1⇓D, vii–ix; green). It was possible to use clathrin H chain as the final acceptor based on the overlap of its spectra with Cy3 or FITC. Furthermore, immunoprecipitation of dynamin-2, a well-described mediator in CME, in PAF-stimulated PMNs also elicited the coprecipitation of the dimeric PAFR (Fig. 1⇓E). 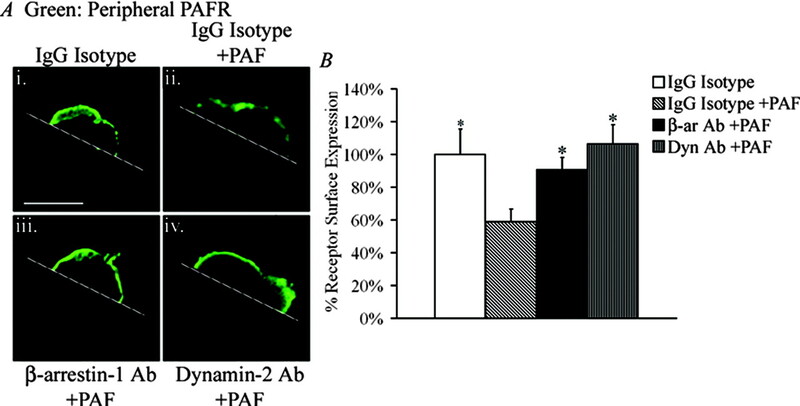 In addition, immunoprecipitation of β-arrestin-1 from membrane fractions demonstrated PAF-dependent coprecipitation of the AP-2 protein, α-adaptin, a marker of CME, and the PAFR (Fig. 1⇓F). Additionally, to demonstrate our subcellular preparation proteins known to be found in the cytosol, membrane and granules were probed for in subcellular fractions prepared from resting PMNs (Fig. 1⇓G). PAF ligation recruits components of CME. A, PMNs were stimulated with buffer or 2 μM PAF for 1 min, and immunoprecipitation of whole cell lysates was performed using Abs to β-arrestin-1 (buffer and PAF) or isotypic IgG controls (goat; Iso). Western blots probed for the PAFR (40 and 80 kDa), clathrin H chain (200 kDa), and β-arrestin-1 (50 kDa). PAF-induced coprecipitation of the PAFR and clathrin H chain following PAF treatment, as compared with buffer-treated PMNs (n = 5). B, Probing β-arrestin-1 immunoprecipitates for phosphoserine demonstrated similar bands as in A at 40 and 80 kDa (n = 5). C, The interaction between β-arrestin-1 (acceptor; i–iii, vii–ix; red) and the PAFR (donor; iv–vi, x–xii; green) was analyzed using acceptor photobleaching FRET. An initial image was acquired of both the acceptor channel (Cy3; i and vii) and donor channel (FITC; iv and x) followed by Cy3 photobleaching using Coumarin 540 nm dye cube within only the region of interest (defined by the white square) being photobleached (ii, v, viii, and xi). A second image was acquired at the same x, y, z coordinates and the effect of photobleaching is demonstrated by subtraction of the second image (Post) from the first (Pre) (iii and ix), which found no photobleaching outside of the defined region of interest. FRET-positive images were determined by the formula described in Materials and Methods, demonstrating that following PAF treatment (+PAF) there was a positive FRET interaction (xii) between β-arrestin-1 and the PAFR as compared with resting cells (vi) (scale bar, 7 μm; >20 cells in two independent experiments). D, FRET analysis was done using techniques similar to those used in C, but the clathrin H chain (acceptor; i–iii; blue) was photobleached using a Rhodamine 610 dye cube. Photobleaching Cy5 demonstrated a FRET positive interaction between clathrin H chain and both β-arrestin-1 (donor; iv–vi; red) and the PAFR (donor; vii–ix; green) (scale bar, 7 μm; >20 cells in two independent experiments). E, Immunoprecipitation (IP) of whole cell lysates using Abs to dynamin-2 (buffer and PAF) or IgG-isotype controls (goat; Iso) demonstrated coprecipitation of the dimer PAFR (80 kDa), as compared with buffer-treated PMNs (n = 3). F, PMNs were stimulated with buffer or 2 μM PAF for 1 min, subcellular fractions prepared, and the cytosol and membrane fractions immunoprecipitated using Abs to β-arrestin-1 (buffer and PAF). Western blots probed for the PAFR and α-adaptin. 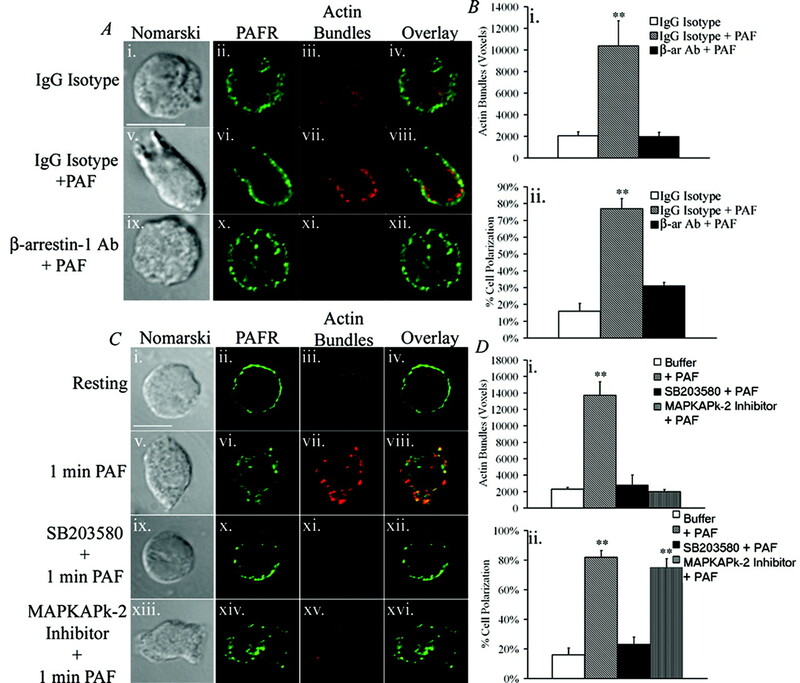 PAF-induced coprecipitation of the PAFR and α-adaptin in the membrane fraction following PAF treatment is shown, as compared with buffer-treated PMNs and the cytosol from both resting PMNs and PAF-treated PMNs (n = 5). G, Subcellular fractions were prepared from resting PMNs, and Western blots probed for proteins specific for the cytosol (lactate dehydrogenase), membrane (L-selectin), and granules myeloperoxidase (MPO) (n = 3). Because Ca2+ mobilization is a G protein-coupled receptor-mediated event and repeated stimulations by the same agent causes the receptor to become desensitized, i.e., refractory to repeated exposures to the same agonist, we investigated the role of β-arrestin-1 in receptor desensitization and PAFR internalization (13). In Fig. 2⇓, neutralizing Abs against β-arrestin-1 or an IgG isotype control were intracellularly introduced using BioPorter, a liposomal-based delivery system (21). Intracellular neutralization of β-arrestin-1 resulted in a loss of desensitization, as evidenced by undiminished Ca2+ mobilization in response to repeated PAF treatments. In contrast, intracellular introduction of an IgG isotype control had no effect on receptor desensitization with PAF stimulation. β-arrestin-1-dependent desensitization of the PAFR. Cells were incubated with BioPorter loaded with a neutralizing Ab to β-arrestin-1 (β-ar) Ab (solid line) or isotypic (Iso) control IgG (dashed line) for 2 h, and subsequently loaded with the Ca2+ indicator indo-1-AM. Stored Ca2+ release was monitored for 5 min, with PAF stimulations at 30 s (1) and 180 s (2) indicated by arrows. Cells incubated with IgG (dashed line) demonstrated normal desensitization indicated by the presence of a single increase in cytosolic Ca2+ release (PAF for 30 s). 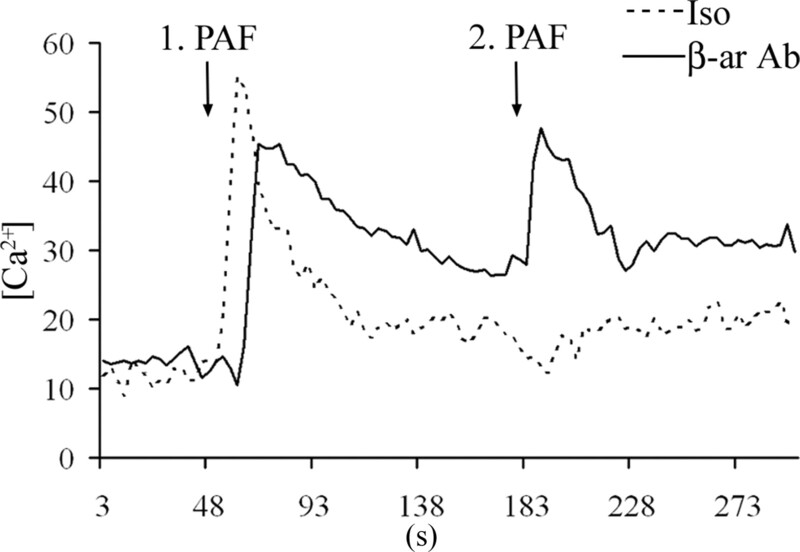 In contrast, Abs against β-arrestin-1 (solid line) inhibited PAFR desensitization as demonstrated by a second increase in cytosolic Ca2+ release following a second PAF stimulation (PAF for 180 s) (n = 4). To determine whether PAFR internalization was β-arrestin-1 and dynamin-2 dependent, neutralizing Abs to β-arrestin-1, dynamin-2, or an IgG isotype control were introduced into PMNs, stimulated with buffer or PAF, and then smeared onto slides but the cells were not permeabilized (Fig. 3⇓A). Using an Ab to an extracellular epitope on the N terminus of the PAFR, we assessed the amount of peripheral membrane-associated receptor. Compared with resting IgG isotype cells (Fig. 3⇓A, i), there was a decrease in membrane-associated PAFR in the PAF-treated IgG-loaded cells (Fig. 3⇓A, ii), whereas intracellular neutralization of β-arrestin-1 (Fig. 3⇓A, iii) and dynamin-2 (Fig. 3⇓A, iv) had membrane associated PAFR levels identical with the resting cells, and these differences were statistically significant as compared with the PAF-treated IgG-loaded controls (Fig. 3⇓B). Figures are representative of cross-sections of a middle plane of PMNs. β-arrestin-1-and dynamin-2-dependent PAFR endocytosis. A, Cells were incubated with BioPorter loaded with a neutralizing Ab to β-arrestin-1 (iii), dynamin-2 (iv), or an IgG isotype control (i and ii) for 2 h, and subsequently stimulated with buffer (i) or 2 μM PAF (ii–iv). Slides of nonpermeabilized cells labeled with a N terminus-specific Ab to the PAFR were visualized, and demonstrated internalization of the PAFR following PAF treatment of PMNs (ii), whereas introduction of a β-arrestin-1 Ab (iii) or a dynamin-2 Ab (iv) demonstrated expression levels similar to buffer-treated IgG controls (i) (scale bar, 7 μm; >20 cells in two independent experiments). B, Statistical analysis of PAFR immunoreactivity in the membranes (voxel occupation), measured by the percentage of receptor surface expression, demonstrated significant differences between the IgG PAF-treated cells and the IgG buffer-treated controls, β-arrestin-1 Ab cells, and dynamin-2 Ab cells. Results represent the mean ± SEM from >20 cells in two independent experiments. ∗, p < 0.05, using ANOVA. β-arrestin-1 and dynamin-2 can recruit and activate members of the MAPK family (2). Because PAF causes rapid activation of p38 MAPK, we sought to determine its possible association with β-arrestin-1 or dynamin-2 (22). Whole cell lysates from PAF stimulated (1 min) were immunoprecipitated with an Ab against β-arrestin-1, which coprecipitated both p38 MAPK and the upstream regulator MKK3, and was not present in controls or immunoprecipitation with an IgG isotype (Fig. 4⇓A). PAF stimulation of PMNs also demonstrated colocalization (Fig. 4⇓B, viii, shown in pseudocolor) of dual phosphorylation (Thr180/Tyr182) of p38 MAPK, phospho-p38 MAPK (Fig. 4⇓B, i and vi; green) with β-arrestin-1 (Fig. 4⇓B, ii and vii; red) at the periphery of the cell, which was not present in resting cells (Fig. 4⇓B, iii). Similarly, phosphorylated MKK3 (Fig. 4⇓C, i and vi; green) translocated to the plasma membrane and had some colocalization with β-arrestin-1 (Fig. 4⇓C, ii and vii; red) following PAF treatment (Fig. 4⇓C, viii, shown in pseudocolor). Furthermore, the distribution of total p38 MAPK (Fig. 4⇓B, iv and ix) was similar to phospho-p38 MAPK following treatment with PAF, which colocalized with β-arrestin-1 at the periphery of the cell (Fig. 4⇓B, x, shown in pseudocolor). Total MKK3 (Fig. 4⇓C, iv and ix) demonstrated similar results, colocalizing with β-arrestin-1 following PAF treatment (Fig. 4⇓C, x, shown in pseudocolor). This colocalization was further confirmed with FRET analysis, which demonstrated a FRET-positive, physical interaction between phospho-MKK3 (Fig. 4⇓D, ii and iii) and β-arrestin-1 (Fig. 4⇓D, v and vi) following PAF treatment (Fig. 4⇓D, vii). Furthermore, immunoprecipitation of β-arrestin-1 from subcellular fractions of PAF-treated PMNs demonstrated (phospho-p38 MAPK) in the membrane fraction (Fig. 4⇓E), confirming the microscopy data that suggested that phosphorylation of p38 MAPK at 1 min occurred primarily in the membrane not within the cytosol. In contrast to previous studies, PAF did not cause p38 MAPK to coprecipitate with dynamin-2 (Fig. 4⇓F). β-arrestin-1 recruits MKK3/p38 MAPK with activation at the site of recruitment. A, Immunoprecipitation of β-arrestin-1 from whole cell lysates demonstrated coprecipitation of both p38 MAPK (38 kDa) and MKK3 (35 kDa) following PAF treatment, which was not present in buffer-treated PMNs or in those subjected to immunoprecipitation with IgG (n = 4). 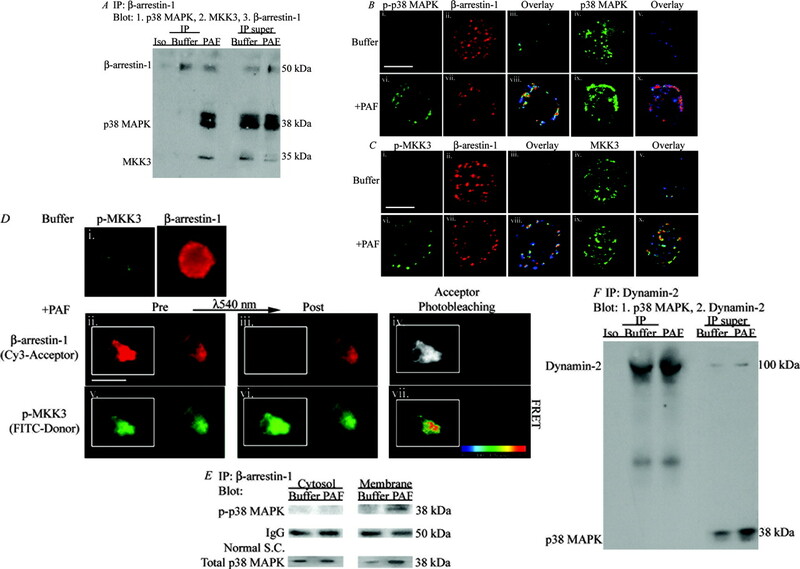 B, Digital microscopy of dual phosphorylation (Ser/Thr) of p38 MAPK (p-p38 MAPK) (i and vi) and β-arrestin-1 (ii and vii) in fixed cells showed very little phospho-p38 MAPK in resting cells (i) with equal distribution of β-arrestin-1 (ii), resulting in negligible colocalization (iii). Following 1 min of PAF treatment, phospho-p38 MAPK immunoreactivity was increased (iv), β-arrestin-1 was restricted to the periphery (vii), and there was colocalization shown in pseudocolor (viii). B, The distribution of total p38 MAPK (iv and ix) was similar to phospho-p38 MAPK following treatment with PAF, which colocalized with β-arrestin-1 at the periphery of the cell (x, shown in pseudocolor) (scale bar, 7 μm). Data are representative of three independent experiments. C, Similar spatial distribution was visualized in fixed PMNs with very little phospho-MKK3 in resting cells as compared with PAF treated cells (i and vi). There is translocation of β-arrestin-1 to the cell periphery with PAF treatment (ii and vii), resulting in modest colocalization between β-arrestin-1 and phospho-MKK3 shown in pseudocolor (viii). Total MKK3 (iv and ix) demonstrated similar results, colocalizing with β-arrestin-1 following PAF treatment (x, shown in pseudocolor) (scale bar, 7 μm). Data are representative of three independent experiments. D, Acceptor photobleaching FRET was performed between β-arrestin-1 (acceptor; red) and phospho-MKK3 (donor; green), in identical fashion as that described in Fig. 1⇑C. Resting cells (i) demonstrated very little phospho-MKK3, therefore FRET was not performed on buffer-treated controls. PAF-treated cells (ii–vii), however, found a positive FRET interaction between β-arrestin-1 and phospho-MKK3 (vii) (scale bar, 7 μm; >20 cells in two independent experiments). E, Discontinuous sucrose fraction were used to prepare pure cellular cytosol and membrane fractions, which were immunoprecipitated using an Ab against β-arrestin-1. Probing Western blots for phospho-p38 MAPK demonstrated immunoreactivity occurring only in the membrane fraction following PAF treatment as compared with resting membrane fractions and both resting and PAF-treated cytosols (n = 4). Normal S.C., normal subcellular. F, Immunoprecipitation of whole cell lysates using an Ab against dynamin-2 exhibited no coprecipitation of p38 MAPK from either buffer or PAF treatment, but demonstrated immunoreactivity in the postimmunoprecipitation supernatant (n = 3). Because of the observed physical interaction between the p38 MAPK signalosome and β-arrestin-1 and because dynamin-2 may be important in the activation of MAPKs, we investigated the role of these mediators of CME on p38 MAPK activation (23, 24). Using phospho-p38 MAPK as a readout, neutralizing Abs against β-arrestin-1 and dynamin-2 or isotype IgG controls were introduced, and whole cell lysates were probed for phospho-p38 MAPK and p38 MAPK (Fig. 5⇓). 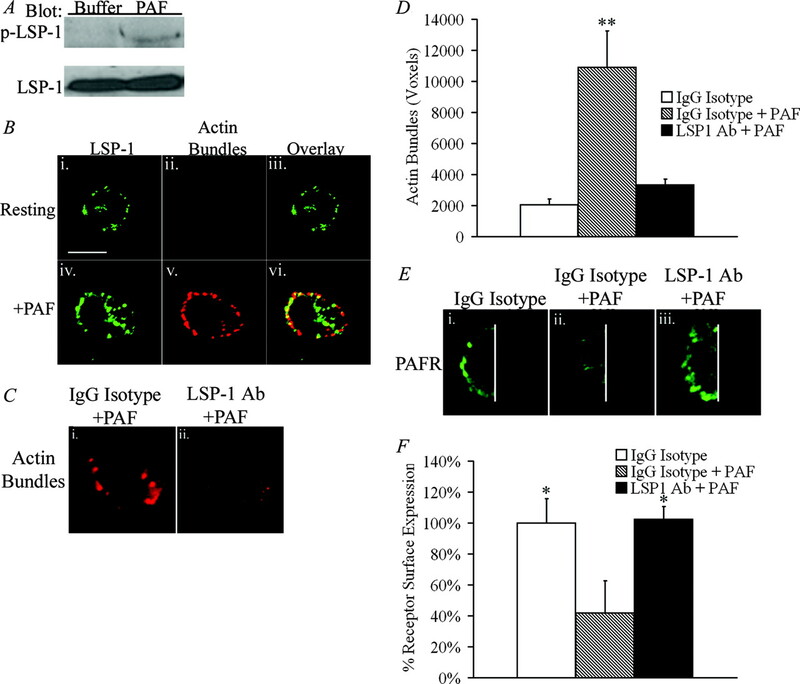 Intracellular introduction of Abs specific to β-arrestin-1 abrogated PAF-mediated p38 MAPK activation, whereas introduction of IgG isotype controls did not affect PAF-mediated activation of p38 MAPK (Fig. 5⇓). Furthermore, intracellular neutralization of dynamin-2 did not inhibit p38 MAPK activation and demonstrated a similar amount of phospho-p38 MAPK compared with the isotype control (Fig. 5⇓). β-arrestin-1-dependent but dynamin-2-independent p38 MAPK activation. PMNs were incubated with buffer or BioPorter loaded with 4 μg of isotype IgG (Iso), dynamin-2 Ab (Dyn), or β-arrestin-1 Ab (β-ar), and subsequently stimulated with buffer (Resting) or 2 μM PAF. Introduction of the Abs did not cause p38 MAPK phosphorylation (p-p38 MAPK), but PAF treatment caused an increase in the phosphorylation of p38 MAPK in the IgG isotype-loaded control, which was abrogated by the intracellular introduction of the β-arrestin-1 Ab and unaffected by introduction of the dynamin-2 Ab (n = 3). To determine the MAPK kinase kinase (MAP3K) upstream of MKK3, PMNs were treated with PAF (1 min) and MKK3 was immunoprecipitated from whole cell lysates (Fig. 6⇓A). The immunoprecipitates were probed with specific Abs to known MAP3K activators of MKK3: p21 (Cdc42/Rac)-activated kinase 1/3 (PAK1/3), TAK1, and ASK1. In contrast with previous reports, PAF stimulation did not cause PAK1/3 (25) or TAK coprecipitation with MKK3 (26) (data not shown, available upon request). Rather, PAF-elicited ASK1 coprecipitation with MKK3, which was absent in buffer-treated controls (Fig. 6⇓A). Surprisingly, there was constitutive binding between p38 MAPK and ASK1, which was unchanged with PAF treatment (Fig. 6⇓B). Because ASK1 is reported to primarily reside in the cytosol, subcellular fractions were prepared and ASK1 was immunoprecipitated from the cytosol and membrane (15). PAF caused coprecipitation of both phospho-MKK3 and phospho-p38 MAPK with ASK1 in both the plasma membrane and the cytosol, and in control PMNs these interactions were absent in the membrane and comparatively diminished in the cytosol (Fig. 6⇓C). Assembly and activation of a p38 MAPK signaling cassette. PMNs were stimulated with buffer or 2 μM PAF for 1 min. Whole cell lysates immunoprecipitated for MKK3 (A) found coprecipitation of ASK1 following PAF treatment, which was not present in buffer-treated controls (n = 3). B, Immunoprecipitation of p38 MAPK found coprecipitation of ASK1 in both PAF-treated and buffer-treated cells (n = 3). C, The immunoprecipitation of ASK1 from subcellular fractions (cytosol and membrane) from PMNs stimulated with buffer or PAF and probed for phospho-p38 MAPK and phospho-MKK3 found coprecipitation of both phospho-p38 MAPK and phospho-MKK3 in both the cytosol and membrane fractions following PAF treatment (n = 3). Many chemoattractants cause rapid actin rearrangement, and the effect of PAF on F-actin rearrangement was visualized by digital microscopy (Fig. 7⇓A). Consistent with previous studies, comparison of the Nomarski images (18) (Fig. 7⇓A, iii) with fluorescent images (Fig. 7⇓A, iv and v) demonstrated actin polymerization at the pseudopod following PAF treatment (Fig. 7⇓A, white arrows). In addition, when the angle between two actin filaments with the same point of origin was measured there was an ∼70° angle, characteristic of ARP2/3-mediated actin polymerization (18) (Fig. 7⇓A, vi). Present also were punctate actin formations on the periphery of the cell body distinct from the PAF-induced F-actin in the pseudopodia (Fig. 7⇓A, v). These PAF-mediated peripheral F-actin accumulations in the cell body consisted of actin bundles because they displayed distinct immunoreactivity with an Ab specific for an epitope present only during actin bundle formation (Fig. 7⇓B, iv), which were not present in a cross-section of the pseudopodia (Fig. 7⇓B, v). To better define cell polarization and active actin polymerization, slides were prepared looking at ARP3, a component of the actin polymerization protein ARP2/3 (Fig. 7⇓C). Following PAF treatment (Fig. 7⇓C, iii and iv) there was a dramatic shift in ARP3 from the cytosol and periphery (Fig. 7⇓C, ii) to the pseudopod (Fig. 7⇓C, iii and iv). PAF-mediated actin rearrangement. 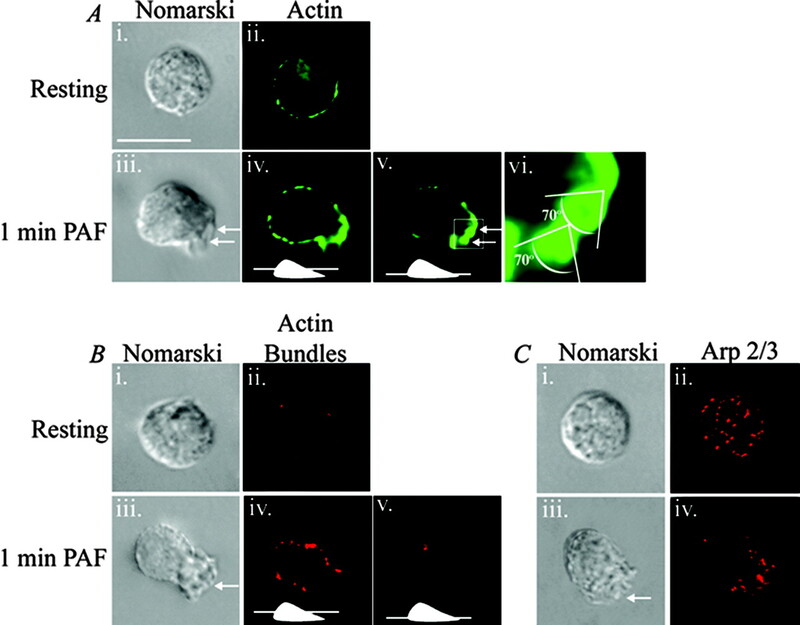 PMNs stimulated with buffer or PAF were fixed, permeabilized, and Nomarski images (i and iii) were obtained using Nomarski-modified differential interference contrast microscopy. A, Resting cells (i and ii) demonstrated smooth edges and peripheral actin distribution, whereas PAF treatment caused cell polarization (iii) with F-actin distribution occurring at the pseudopod when a plane that transects the pseudopodia is visualized (iv; white arrow). A more central cross-section of the cell body (v; white arrow) saw more peripheral actin distribution with some actin beginning to form at the edge of the pseudopod (scale bar, 7 μm). Additionally, the angle between two actin filaments with the same point of origin was measured, and the polarized edge was magnified to demonstrate an ∼70° angle (vi). B, Nomarski images show an increase in cell polarization with PAF treatment (iii) compared with resting cell (i) and similar to A. Using an Ab specific for an epitope only found when actin bundles are formed, PMNs had very little actin bundle formation in resting cells (ii), with immunoreactivity increasing with PAF treatment (iv–v). Planes transecting the pseudopodia (iv; white inset) did not demonstrate large increases in actin bundle formation as compared with a plane corresponding to the cell body proper (v; white inset) (scale bar, 7 μm). C, The distinction between resting (i) and PAF-treated (iii) Nomarski images and how they correlate to polarization and active actin polymerization cells were visualized for ARP3 (ii and iv; red), which had an even distribution in resting cells with accumulation at the polarized edge following PAF treatment (scale bar, 7 μm). Data in all experiments are representative of three independent experiments. To determine the importance of CME scaffold protein β-arrestin-1 in actin bundle formation in the cell body and for cell polarization (i.e., pseudopodia formation), we introduced neutralizing Abs to β-arrestin-1 or IgG isotypes controls followed by stimulation of PMNs for 1 min with PAF or buffer (Fig. 8⇓). To assess polarization, Nomarski images were obtained to view the formation of pseudopodia as evidence for active actin rearrangement based on the prior results seen in Fig. 7⇑. The formation of actin bundles were assessed using Abs specific to an epitope present only after the formation of actin bundles. 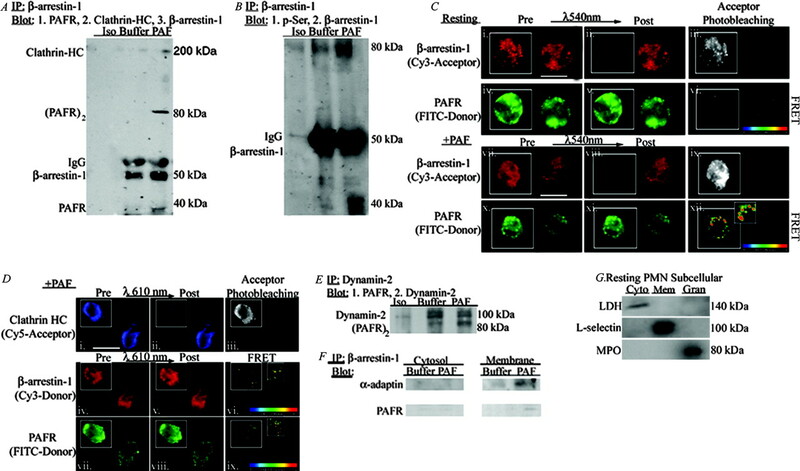 The spatial relationship with the PAFR was determined using an Ab against an extracellular epitope to the PAFR, and slides were labeled before permeabilization to ensure extracellular labeling (Fig. 8⇓A). IgG isotype cells treated with PAF demonstrated cell polarization (Fig. 8⇓A, v) and actin bundle formation (Fig. 8⇓A, vii). Moreover, these actin bundles colocalized with the PAFR (Fig. 8⇓A, viii). In contrast, intracellular neutralization of β-arrestin-1 significantly inhibited actin bundle formation as well as cell polarization (Fig. 8⇓A, ix-xii), similar to the IgG isotype in resting cells (Fig. 8⇓A, i-iv). Furthermore, abrogation with β-arrestin-1 Abs was statistically different from PAF-treated IgG isotype cells (Fig. 8⇓B, i and ii). Neutralization of dynamin-2 had no effect on actin bundle formation, similar to the IgG isotype (data not shown). Regulation of actin bundle formation by β-arrestin-1, p38 MAPK, and MAPKAPK-2. A, PMNs were loaded with an IgG isotype (i–viii) or a β-arrestin-1 Ab (ix–xii) and stimulated with buffer or PAF (1 min). Nomarski images (i, v, and ix) revealed that the β-arrestin-1 Ab abrogated cell polarization similar to resting cells, contrasting the PAF-treated cells. Staining for the PAFR (ii, vi, x; green) and actin bundles (iii, vii, xi; red) demonstrated actin bundle formation following PAF treatment, but was abrogated to levels similar to controls when loaded with the β-arrestin-1 Ab. The actin bundle formations seen in IgG-isotype PAF-treated cells colocalized with the PAFR (viii) (scale bar, 7 μm). Data are representative of three independent experiments. B, The differences in actin bundle formation (i) and cell polarization (ii), determined by the presence of a pseudopod between PAF-treated cells in both resting and the β-arrestin-1 Ab-loaded cells, were statistically different (∗∗, p < 0.01; >20 cells in two independent experiments). C, Pretreatment of cells with the p38 MAPK inhibitor (SB203580) or DMSO followed by PAF stimulation (ix and xii) inhibited both cell polarization and actin bundle formation as compared with buffer pretreatment/PAF-treated cells (i–viii). In contrast, pretreatment with a MAPKAPK-2 inhibitory peptide (xiii–xvi) had little effect on cell polarization, though actin bundle formation was diminished (scale bar, 7 μm). Data are representative of three independent experiments. D, The differences in actin bundle formation (i) between the inhibitory groups and PAF-treated cells were statistically significant (∗∗, p < 0.01, using ANOVA). Results represent the mean ± SEM from >20 cells in two independent experiments. Significant differences were similar (∗∗, p < 0.01, using ANOVA) in cell polarization (ii) between the SB203850 group and PAF-treated and MAPKAPK-2 inhibitory peptide group. Results represent the mean ± SEM from >20 cells in two independent experiments. To investigate whether the p38 MAPK signaling cassette was necessary for actin bundle formation at the receptor membrane interface, PMNs were incubated with the specific p38 MAPK inhibitor SB203580 (1 μM) for 5 min before PAF or buffer stimulation. Inhibition of p38 MAPK demonstrated a marked decrease in actin bundle formation (Fig. 8⇑C, xi) as well as cell polarization (Fig. 8⇑C, ix) as compared with DMSO-pretreated, PAF-stimulated cells (Fig. 8⇑C, v–viii). 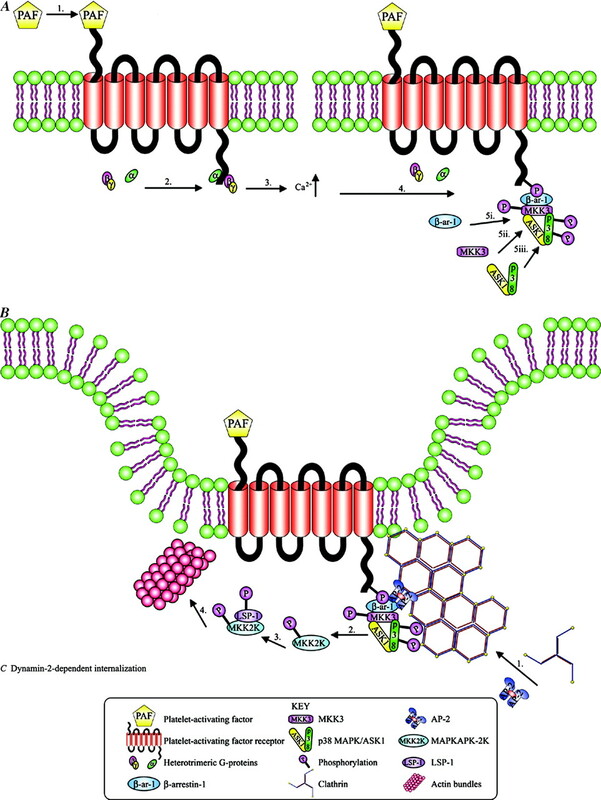 These results are similar to those seen with the intracellular neutralization of β-arrestin-1, for this neutralization inhibited both actin bundle formation and polarization, different from PAF-treated cells (Fig. 8⇑D, i and ii). Because p38 MAPK may activate a number of downstream kinases, we pretreated PMNs with a specific inhibitor of MAPK-activated protein kinase-2 (MAPKAPK-2) that may be activated by p38 MAPK and is known to elicit actin-mediated cytoskeletal rearrangement (27). Inhibition of MAPKAPK-2 caused virtually complete disappearance of the actin bundles in the cell body (Fig. 8⇑C, xv) but had little effect on PAF-induced cell polarization and pseudopod formation (Fig. 8⇑C, xiii), similar to PAF-stimulated PMNs (Fig. 8⇑D, i and ii). Because LSP-1 is a known substrate for MAPKAPK-2 and present in PMNs, whole cell lysates were prepared from PMNs stimulated with buffer or 2 μM PAF for 1 min (28). Phosphorylated LSP-1 demonstrated immunoreactivity following PAF treatment, but was not present in buffer-treated controls (Fig. 9⇓A). Digital microscopy demonstrated that LSP-1 has a peripheral distribution irrespective of buffer or PAF treatment (Fig. 9⇓B, i and iv; green); however, PAF elicited the formation of actin bundles (Fig. 9⇓B, ii and v; red) that colocalized with LSP-1 (Fig. 9⇓B, vi). To study the dependence of actin bundles on LSP-1, Abs specific to the C terminus of LSP-1 or an IgG isotype were introduced. Isotype controls had little effect on actin bundle formation, whereas Abs against LSP-1 inhibited actin bundle formation (Fig. 9⇓, C–D). Finally, to understand the dependence of PAFR internalization on LSP-1, Abs against LSP-1 were introduced, and the PAFR visualized with an Ab to the external N terminus. Neutralization of LSP-1 diminished the ability of PAF-mediated receptor internalization, similar to resting cells (Fig. 9⇓, E and F). In contrast, PAF treatment of IgG isotype cells significantly internalized the PAFR as compared with LSP-1 Ab-treated cells as well as buffer-treated IgG isotype cells (Fig. 9⇓, E and F). LSP-1 colocalization and regulation of actin bundle formation. A, PMNs were stimulated with buffer or PAF for 1 min, and whole cell lysates prepared, which demonstrated immunoreactivity with an Ab specific to LSP-1 phosphorylation (p-LSP-1) following PAF treatment. B, Slides were prepared and Abs against LSP-1 (i and iv) and actin bundles (ii and v) showed colocalization following PAF treatment (vi), which was not present in buffer-treated controls (iii) (scale bar, 7 μm). Data are representative of three independent experiments. C and D, Neutralization of LSP-1 demonstrated inhibition of actin bundle formation following PAF treatment, with normal formation in PAF-treated IgG isotype cells. Results represent the mean ± SEM from >20 cells in two independent experiments. ∗∗, p < 0.01, using ANOVA. E and F, The differences in actin bundle formation between PAF-treated cells loaded with LSP-1 neutralizing Abs and IgG isotype Abs were statistically significant. ∗∗, p < 0.01, using ANOVA. Results represent the mean ± SEM; from >20 cells in two independent experiments. The rapid response of PMNs to extracellular stimuli, especially chemoattractants, is inherent to their defensive function in the tissues. PAF activation of its receptor on the PMN membrane caused CME, as evidenced by the physical association, FRET positive, of the PAFR with known proteins required for CME (13, 29). Moreover, PAFR desensitization was β-arrestin-1-dependent, with receptor internalization requiring both β-arrestin-1 and dynamin-2. This translocation and binding of β-arrestin-1 to the PAFR provided a platform for recruitment of a p38 MAPK signalosome (ASK1/MKK3/p38 MAPK) and its subsequent activation. Activation of p38 MAPK elicited two distinct forms of actin polymerization through stimulation of two separate pathways: 1) ARP2/3 leading to the formation of the pseudopod, i.e., cell polarization, and 2) MAPKAPK-2 phosphorylation of LSP-1 resulting in actin bundle in the cell body (28). All of the described signaling steps, as well as actin rearrangement, occurred within 60 s of receptor ligation, proximal and independent of dynamin-2-mediated endosomal scission. In the described experiments, we used primary cells and the intracellular introduction of specific Abs for the neutralization of CME proteins, which complemented the data using immunoprecipitation and digital microscopy. Our purpose was predicated upon the suggestion that translation of findings from immortalized cell lines may not always hold true for primary cells or in vivo (30). The presented data have some similarities with previous work in transformed cell lines, specifically the roles of β-arrestin-1 and dynamin-2 (4, 31). However, our data contrast previous PAFR models in which β-arrestin-1 supports a p42/44 signalosome rather than a p38 MAPK signalosome (32). These data demonstrate that in primary cell as compared with immortalized cells, ligation may activate distinctly different signaling pathways, though using the same scaffolding. Previous data have documented that PAF signaling (PAFR) in transfected cells requires CME because the observed PAF-induced effects were dynamin-2-dependent and because RNA silencing of dynmain-2 resulted in inhibition of PAF-induced effects, including receptor internalization and degradation (29). Furthermore, PAF signaling also required β-arrestin-1 (arrestin-2), for mutations of this protein abrogated the effects of PAF in this immortalized cell line (13). Similar to these data, PAF ligation of its receptor on PMNs rapidly initiated CME as evidenced by the physical association of the PAFR with the clathrin H chain, the α-adaptin subunit of the AP-2 domain of the clathrin pit, and dynamin-2, proteins integral to CME (33, 34). In addition, PAF stimulation of PMNs resulted in the internalization of the PAFR, which was dynamin-2- and β-arrestin-1-dependent, consistent with previous reports showing dynamin mutants caused attenuation of endogenous receptor recycling (29). Although the PAFR is well characterized with respect to arrestin binding for the termination of heterotrimeric G protein signaling, its ability to support the assembly of signalosomes specifically related to cell function remains undefined (13, 29, 32). In this study, we describe new insights into the assembly of signaling cascades in response to receptor ligation before dynamin-2-induced vesicle scission. The role of members of the arrestin family to mediate kinase activation is also a well-established phenomenon, including activation of members of the Src family, ERK1/2, and JNK3 (2, 4, 6). Activation often includes the recruitment and interaction of arrestins with upstream MAPKs (ASK1, MEK3, MKK3, and MEK kinase-2) (31, 35, 36, 37). Our data demonstrated that ASK1 is the MAP3K recruited to β-arrestin-1, which was surprising because a number of investigators have postulated that TAK or PAK were the most likely candidates for p38 MAPK activation (TAK/PAK) (38), and ASK1 is best characterized in apoptosis (39, 40). Under osmotic stress or stimulation with TNF-α, ASK1 is activated by 1) the oxidation of thioredoxin, releasing ASK1 and promoting dimerization or 2) the dephosphorylation of Ser967 on ASK1, which causes dissociation from protein 14-3-3 (41, 42, 43, 44). In both cases, release of ASK1 leads to p38 MAPK activation and apoptosis; however, PMNs incubated with PAF demonstrated significantly higher survival rates at 24 h compared with controls, and pretreatment of PMNs with PAF abolishes TNF-α-induced apoptosis (45). With regard to cassette assembly, McDonald et al. (37) reported that cotransfection of β-arrestin-2 and the angiotensin II type 1a receptor into COS-7 cells led to ASK1-mediated activation of JNK3. However, in PMNs ASK1 participated in a signaling cassette with MKK3 and p38 MAPK. In addition, for assembly of the ASK1/MKK3/p38 MAPK signalosome, β-arrestin-1 recruited MKK3 (FRET positive) and a preformed ASK1/p38 MAPK pair, present in control PMNs, for p38 MAPK activation. Importantly, neither ASK1 nor p38 MAPK demonstrated the physical association (FRET positive) with β-arrestin-1 supporting this assembly pattern. A significant finding in this study is the divergent signaling directly downstream of p38 MAPK. p38 MAPK activation at the membrane lead to the formation of two disparate types of polymerized actin. The first type is the 70° actin filaments in the pseudopodia responsible for cell polarization that colocalized with ARP2/3 and the second is the actin bundles in the cell body at the site of the PAFR. Antagonism (SB203580) of p38 MAPK significantly inhibited both cell polarization and actin bundle formation; whereas, inhibition of MAPKAPK-2 or intracellular neutralization of LSP-1 solely diminished actin bundle formation. These data are similar to results demonstrating that leukocytes from ASK1−/− or p38 MAPK−/− mice exhibit impaired actin polymerization and decreased chemotaxis (46). The formation of actin bundles at the site of the PAFR is novel and intriguing in PMNs, which lack fascin, a protein associated with actin bundles in other cell lines (47). We have demonstrated that the specific actin epitope presented only upon actin bundle formation was 1) at the site of the PAFR in the cell body (as opposed to the pseudopod), 2) colocalized with MAPKAPK-2 and LSP-1, 3) was inhibited by selective antagonists for MAPKAPK-2, 4) colocalized with phosphorylated LSP-1, and 5) was diminished when LSP-1 was neutralized by intracellular introduction of a specific Ab. Furthermore, LSP-1 is a known substrate for MAPKAPK-2 (28) and has homology with villin, an actin bundling protein, implying that LSP-1 may have very similar characteristics (48, 49). These results suggest that LSP-1 may serve a similar role as fascin in actin bundle formation in PMNs, and future studies are required to corroborate these findings. In conclusion, PAF ligation of its receptor causes recruitment of β-arrestin-1 to the membrane, which serves a dual role and is demonstrated in Fig. 10⇓. The data presented provide evidence that endocytosis is a complex, multifaceted signaling mechanism that may provide multiple signaling platforms to rapidly change the structure and ultimately the function of motile cells, especially leukocytes. Further work is required to establish whether the described signaling platforms are present and conserved in multiple cell types or whether these transduction pathways inherent to PAF-mediated CME are restricted to leukocytes. Proposed mechanism of PAF-mediated β-arrestin-1-dependent p38 MAPK signaling. A, PAF ligation of its receptor (1) causes the recruitment of the heterotrimeric subunits α and βγ (2), resulting in the release of intracellular calcium (3). Following receptor phosphorylation (4), β-arrestin-1 is recruited to the receptor (5i), which recruits MKK3 (5ii), and p38 MAPK/ASK1 (5iii) facilitating the activation (phosphorylation) of MKK3 and p38 MAPK. B, Following the assembly of this complex, elements of CME are recruited, including clathrin H chain and L chain and AP-2 (β-arrestin-1-interacting protein), which are necessary for receptor internalization. This complex facilitates the activation (phosphorylation) of MAPKAP2K (2), which then phosphorylates LSP-1 (3) leading the formation of actin bundles at the membrane near the receptor (4). C, The receptor is then internalized in a dynamin-2-dependent manner. ↵1 This work was supported by Bonfils Blood Center, Grant HL-59355-06 from the National Heart, Lung, and Blood Institute and Grant GM-49222 from the National Institute of General Medical Sciences. ↵3 Abbreviations used in this paper: CME, clathrin-mediated endocytosis; PMN, polymorphonuclear neutrophil; PAF, platelet-activating factor; PAFR, PAF receptor; ASK1, apoptosis signal-regulating kinase-1; MKK, MAPK kinase-3; MAPKAPK-2, MAPK-activated protein kinase-2; LSP-1, leukocyte-specific protein-1; FRET, fluorescent resonance energy transfer; PAK, p21-activated kinase; ARP, actin-related protein; TAK, TGF-β activated-kinase-1. von Zastrow, M.. 2003. Mechanisms regulating membrane trafficking of G protein-coupled receptors in the endocytic pathway. Life Sci. 74: 217-224. Luttrell, L. M., R. J. Lefkowitz. 2002. The role of β-arrestins in the termination and transduction of G-protein-coupled receptor signals. J. Cell Sci. 115: 455-465. Ferguson, S. S.. 2001. Evolving concepts in G protein-coupled receptor endocytosis: the role in receptor desensitization and signaling. Pharmacol. Rev. 53: 1-24. Pierce, K. L., L. M. Luttrell, R. J. Lefkowitz. 2001. New mechanisms in heptahelical receptor signaling to mitogen activated protein kinase cascades. Oncogene 20: 1532-1539. McCudden, C. R., M. D. Hains, R. J. Kimple, D. P. Siderovski, F. S. Willard. 2005. G-protein signaling: back to the future. Cell Mol. Life Sci. 62: 551-577. McDonald, P. H., R. J. Lefkowitz. 2001. β-Arrestins: new roles in regulating heptahelical receptors’ functions. Cell. Signal. 13: 683-689. Baggiolini, M., A. Walz, S. L. Kunkel. 1989. Neutrophil-activating peptide-1/interleukin 8, a novel cytokine that activates neutrophils. J. Clin. Invest. 84: 1045-1049. Gay, J. C., J. K. Beckman, A. R. Brash, J. A. Oates, J. N. Lukens. 1984. Enhancement of chemotactic factor-stimulated neutrophil oxidative metabolism by leukotriene B4. Blood 64: 780-785. Green, S. P., A. Chuntharapai, J. T. Curnutte. 1996. Interleukin-8 (IL-8), melanoma growth-stimulatory activity, and neutrophil-activating peptide selectively mediate priming of the neutrophil NADPH oxidase through the type A or type B IL-8 receptor. J. Biol. Chem. 271: 25400-25405. Ingraham, L. M., T. D. Coates, J. M. Allen, C. P. Higgins, R. L. Baehner, L. A. Boxer. 1982. Metabolic, membrane, and functional responses of human polymorphonuclear leukocytes to platelet-activating factor. Blood 59: 1259-1266. Pedraza, L., G. C. Owens, L. A. Green, J. L. Salzer. 1990. The myelin-associated glycoproteins: membrane disposition, evidence of a novel disulfide linkage between immunoglobulin-like domains, and posttranslational palmitylation. J. Cell Biol. 111: 2651-2661. Silliman, C. C., N. F. Voelkel, J. D. Allard, D. J. Elzi, R. M. Tuder, J. L. Johnson, D. R. Ambruso. 1998. Plasma and lipids from stored packed red blood cells cause acute lung injury in an animal model. J. Clin. Invest. 101: 1458-1467. Chen, Z., D. J. Dupre, C. Le Gouill, M. Rola-Pleszczynski, J. Stankova. 2002. Agonist-induced internalization of the platelet-activating factor receptor is dependent on arrestins but independent of G-protein activation. Role of the C terminus and the (D/N)PXXY motif. J. Biol. Chem. 277: 7356-7362. Silliman, C. C., K. L. Clay, G. W. Thurman, C. A. Johnson, D. R. Ambruso. 1994. Partial characterization of lipids that develop during the routine storage of blood and prime the neutrophil NADPH oxidase. J. Lab. Clin. Med. 124: 684-694. Ambruso, D. R., B. G. Bolscher, P. M. Stokman, A. J. Verhoeven, D. Roos. 1990. Assembly and activation of the NADPH:O2 oxidoreductase in human neutrophils after stimulation with phorbol myristate acetate. J. Biol. Chem. 265: 924-930. Silliman, C. C., D. J. Elzi, D. R. Ambruso, R. J. Musters, C. Hamiel, R. J. Harbeck, A. J. Paterson, A. J. Bjornsen, T. H. Wyman, M. Kelher, et al 2003. Lysophosphatidylcholines prime the NADPH oxidase and stimulate multiple neutrophil functions through changes in cytosolic calcium. J. Leukocyte Biol. 73: 511-524. Weiner, O. D., G. Servant, M. D. Welch, T. J. Mitchison, J. W. Sedat, H. R. Bourne. 1999. Spatial control of actin polymerization during neutrophil chemotaxis. Nat. Cell Biol. 1: 75-81. Wouters, F. S., P. I. Bastiaens, K. W. Wirtz, T. M. Jovin. 1998. FRET microscopy demonstrates molecular association of non-specific lipid transfer protein (nsL-TP) with fatty acid oxidation enzymes in peroxisomes. EMBO J. 17: 7179-7189. Perron, A., Z.-G. Chen, D. Gingras, D. J. Dupré, J. Staòková, M. Rola-Pleszczynski. 2003. Agonist-independent desensitization and internalization of the human platelet-activating factor receptor by coumermycin-gyrase B-induced dimerization. J. Biol. Chem. 278: 27956-27965. Rane, M. J., Y. Pan, S. Singh, D. W. Powell, R. Wu, T. Cummins, Q. Chen, K. R. McLeish, J. B. Klein. 2003. Heat shock protein 27 controls apoptosis by regulating Akt activation. J. Biol. Chem. 278: 27828-27835. Nick, J. A., N. J. Avdi, S. K. Young, C. Knall, P. Gerwins, G. L. Johnson, G. S. Worthen. 1997. Common and distinct intracellular signaling pathways in human neutrophils utilized by platelet activating factor and FMLP. J. Clin. Invest. 99: 975-986. Schaefer, A. W., H. Kamiguchi, E. V. Wong, C. M. Beach, G. Landreth, V. Lemmon. 1999. Activation of the MAPK signal cascade by the neural cell adhesion molecule L1 requires L1 internalization. J. Biol. Chem. 274: 37965-37973. Benard, O., Z. Naor, R. Seger. 2001. Role of dynamin, Src, and Ras in the protein kinase C-mediated activation of ERK by gonadotropin-releasing hormone. J. Biol. Chem. 276: 4554-4563. Lee, S. H., M. Eom, S. J. Lee, S. Kim, H. J. Park, D. Park. 2001. β-Pix-enhanced p38 activation by Cdc42/Rac/PAK/MKK3/6-mediated pathway: implication in the regulation of membrane ruffling. J. Biol. Chem. 276: 25066-25072. Terada, Y., O. Nakashima, S. Inoshita, M. Kuwahara, S. Sasaki, F. Marumo. 1999. TGF-β-activating kinase-1 inhibits cell cycle and expression of cyclin D1 and A in LLC-PK1 cells. Kidney Int. 56: 1378-1390. Huot, J., F. Houle, S. Rousseau, R. G. Deschesnes, G. M. Shah, J. Landry. 1998. SAPK2/p38-dependent F-actin reorganization regulates early membrane blebbing during stress-induced apoptosis. J. Cell Biol. 143: 1361-1373. Huang, C. K., L. Zhan, Y. Ai, J. Jongstra. 1997. LSP1 is the major substrate for mitogen-activated protein kinase-activated protein kinase 2 in human neutrophils. J. Biol. Chem. 272: 17-19. Dupré, D. J., Z. Chen, G. C. Le, C. Thériault, J.-L. Parent, M. Rola-Pleszczynski, J. Stankova. 2003. Trafficking, ubiquitination, and down-regulation of the human platelet-activating factor receptor. J. Biol. Chem. 278: 48228-48235. Ahn, S., C. D. Nelson, T. R. Garrison, W. E. Miller, R. J. Lefkowitz. 2003. Desensitization, internalization, and signaling functions of β-arrestins demonstrated by RNA interference. Proc. Natl. Acad. Sci. USA 100: 1740-1744. Daaka, Y., L. M. Luttrell, S. Ahn, G. J. Della Rocca, S. S. Ferguson, M. G. Caron, R. J. Lefkowitz. 1998. Essential role for G protein-coupled receptor endocytosis in the activation of mitogen-activated protein kinase. J. Biol. Chem. 273: 685-688. Chen, Z., M. Rola-Pleszczynski, J. Stankova. 2003. Activation of ERK1/2 by platelet-activating factor receptor is independent of receptor internalisation and G-protein activation. Cell. Signal. 15: 843-850. Kim, Y. M., J. L. Benovic. 2002. Differential roles of arrestin-2 interaction with clathrin and adaptor protein 2 in G protein-coupled receptor trafficking. J. Biol. Chem. 277: 30760-30768. Laporte, S. A., W. E. Miller, K. M. Kim, M. G. Caron. 2002. β-Arrestin/AP-2 interaction in G protein-coupled receptor internalization: identification of a β-arrestin binging site in β2-adaptin. J. Biol. Chem. 277: 9247-9254. Luttrell, L. M., S. S. Ferguson, Y. Daaka, W. E. Miller, S. Maudsley, G. J. Della Rocca, F. Lin, H. Kawakatsu, K. Owada, D. K. Luttrell, et al 1999. β-Arrestin-dependent formation of β2 adrenergic receptor-Src protein kinase complexes. Science 283: 655-661. Barlic, J., J. D. Andrews, A. A. Kelvin, S. E. Bosinger, M. E. DeVries, L. Xu, T. Dobransky, R. D. Feldman, S. S. Ferguson, D. J. Kelvin. 2000. Regulation of tyrosine kinase activation and granule release through β-arrestin by CXCRI. Nat. Immunol. 1: 227-233. McDonald, P. H., C. W. Chow, W. E. Miller, S. A. Laporte, M. E. Field, F. T. Lin, R. J. Davis, R. J. Lefkowitz. 2000. β-Arrestin 2: a receptor-regulated MAPK scaffold for the activation of JNK3. Science 290: 1574-1577. Tobiume, K., A. Matsuzawa, T. Takahashi, H. Nishitoh, K. Morita, K. Takeda, O. Minowa, K. Miyazono, T. Noda, H. Ichijo. 2001. ASK1 is required for sustained activations of JNK/p38 MAP kinases and apoptosis. EMBO Rep. 2: 222-228. Ichijo, H., E. Nishida, K. Irie, P. ten Dijke, M. Saitoh, T. Moriguchi, M. Takagi, K. Matsumoto, K. Miyazono, Y. Gotoh. 1997. Induction of apoptosis by ASK1, a mammalian MAPKKK that activates SAPK/JNK and p38 signaling pathways. Science 275: 90-94. Morita, K., M. Saitoh, K. Tobiume, H. Matsuura, S. Enomoto, H. Nishitoh, H. Ichijo. 2001. Negative feedback regulation of ASK1 by protein phosphatase 5 (PP5) in response to oxidative stress. EMBO J. 20: 6028-6036. Hoeflich, K. P., W. C. Yeh, Z. Yao, T. W. Mak, J. R. Woodgett. 1999. Mediation of TNF receptor-associated factor effector functions by apoptosis signal-regulating kinase-1 (ASK1). Oncogene 18: 5814-5820. Gotoh, Y., J. A. Cooper. 1998. Reactive oxygen species- and dimerization-induced activation of apoptosis signal-regulating kinase 1 in tumor necrosis factor-α signal transduction. J. Biol. Chem. 273: 17477-17482. Saitoh, M., H. Nishitoh, M. Fujii, K. Takeda, K. Tobiume, Y. Sawada, M. Kawabata, K. Miyazono, H. Ichijo. 1998. Mammalian thioredoxin is a direct inhibitor of apoptosis signal-regulating kinase (ASK) 1. EMBO J. 17: 2596-2606. Murray, J., J. A. Barbara, S. A. Dunkley, A. F. Lopez, X. Van Ostade, A. M. Condliffe, I. Dransfield, C. Haslett, E. R. Chilvers. 1997. Regulation of neutrophil apoptosis by tumor necrosis factor-α: requirement for TNFR55 and TNFR75 for induction of apoptosis in vitro. Blood 90: 2772-2783. Sun, Y., Z. Cheng, L. Ma, G. Pei. 2002. β-Arrestin2 is critically involved in CXCR4-mediated chemotaxis, and this is mediated by its enhancement of p38 MAPK activation. J. Biol. Chem. 277: 49212-49219. Duh, F. M., F. Latif, Y. Weng, L. Geil, W. Modi, T. Stackhouse, F. Matsumura, D. R. Duan, W. M. Linehan, M. I. Lerman, et al 1994. cDNA cloning and expression of the human homolog of the sea urchin fascin and Drosophila singed genes which encodes an actin-bundling protein. DNA Cell Biol. 13: 821-827. Zhang, Q., Y. Li, T. H. Howard. 2000. Human lymphocyte-specific protein 1, the protein overexpressed in neutrophil actin dysfunction with 47-kDa and 89-kDa protein abnormalities (NAD 47/89), has multiple F-actin binding domains. J. Immunol. 165: 2052-2058. Glenney, J. R., Jr, N. Geisler, P. Kaulfus, K. Weber. 1981. Demonstration of at least two different actin-binding sites in villin, a calcium-regulated modulator of F-actin organization. J. Biol. Chem. 256: 8156-8161.